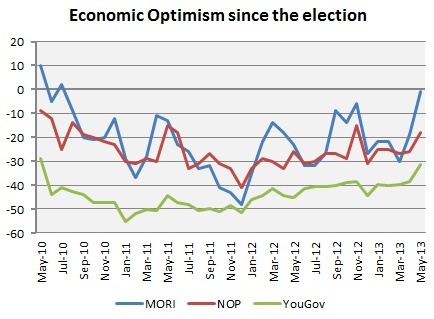 As you can see, the three lines show slightly different results (they ask different questions, and NOP calculate their net figure a different way), but the trends are broadly the same, and all three show a uptick in May this year (though the NOP uptick is less dramatic than the YouGov and MORI ones). What remains to be seen is whether it is sustained – the graph show previous spikes in economic optimism that eventually came to nowt, more economic bad news could do the same here. If it is sustained, the question becomes what effect it has on politics. My own view is that some degree of economic optimism and recovery (even if very slight) is a prerequisite for the Conservatives to stand a chance at the next election, though by no means enough on its own. There are two regular tracking surveys of attitudes toward ID cards – the Home Office commission one, formerly carried out by TNS, now NOP, and the anti-ID card pressure group No2ID commission one, carried out by ICM. Both have released new figures over the last few months, and both show opinion moving against ID cards, albeit, with very different topline figures. The latest wave of the Home Office data shows 56% approving of the “National Identity Service, including identity cards”, 27% opposed – a net approval of +29, down from +35 in their previous survey. Meanwhile ICM’s poll for No2ID found 38% thought that ID cards were a good idea, 60% a bad idea – a net approval of -22, down from +2. So both show opinion moving against ID cards, but overall opinion is vastly different. This is almost certainly down to the different way the questions are asked. In the Home Office polling respondents are first asked why they think the government is introducing ID cards, which will put them in mind of potential benefits of the card, and likely produces a higher approval rating. In No2ID’s polling, the likely cost of an ID card is mentioned in the question, which likely reduces the proportion of people who think it is a good idea. With the results from the Scottish election in, how did the pollsters do? All the pollsters underestimated the level of Conservative support in the constituency section (and all by the same amount), Populus’s Labour support was too low and YouGov’s SNP support too high, leaving ICM as the most accurate in the constituency section. Polling predictions were closer in the regional vote, with all three pollsters have an average error below 2% on the 4 main parties. Populus and ICM’s figures for the Liberal Democrats were both noticably high, but very accurate figures for the other parties meant Populus ended up with the figures closest to the actual result. YouGov were close behind, but got the balance of support amongst the smaller parties wrong, overestimating the level of support for the Greens – this is perhaps the result of switching to including all the minor parties in their question prompt for their last few polls. The final YouGov poll not to prompt using minor parties would have had an average error of 2.0% for the main 4 parties, and 1.6% if you included the Greens – suggesting it would have been less accurate on the main parties, but more accurate for the Green share of the vote. That said, it was done in the middle of April, so voting intention could have changed over the last couple of weeks of the campaign. There weren’t any polls for the local elections, but Rallings and Thrasher predicted notional national shares of the vote of CON 39%, LAB 24%, LDEM 29%. In the event, the notional shares have been calculated as being around CON 40%, LAB 26%, LDEM 26%. Rallings and Thrasher projected that the Conservatives would gain around 330 seats, Labour lose around 500 and the Lib Dems gain around 110, the Labour prediction was almost bang on, but the Conservatives ended up gaining almost 900 and the Lib Dems losing almost 250. Rallings and Thrasher’s projections based on local by-elections have been wrong for two years in a row now, and this time there was no foreign prisoner release scandal to explain it. I suspect that the Liberal Demomcrat’s honed expertise (and the Conservative’s relative incompetence) at by-elections these days simply means that by-elections are not as good a guide to future performance in local elections as they once were. Finally, the Welsh polls were pretty poor, generally under-reporting Conservative support and overestimating Plaid Cymru’s support. Beaufort’s average error was 3.2% in the constituency section and 3.0% on the regional vote. NOP did well in the constituency section, with an average error of 1.9%, but less so in the regional vote with an average error of 3.5%. Again, it’s worth noting that none of these were eve-of-poll predictions, so it could just be that voting intention changed in the final days of the campaign.